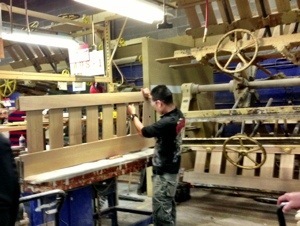 It seems Stickley makes runs on pieces – setting up machines and the required jigs and people – when stockpiles start running low, and then they put all these same pieces on a pallet (for instance, 100 pieces of spindles for a chair), and then move that pallet into a bin with all the other pieces needed for that project. Many cuts are totally automated; our guide told us that drawer pieces (that is, the three sides and bottom) are all spit out of a machine; rough cut wood is taken in, cut to the proper size, sanded, even finished with a quick drying topcoat of some kind, and the piece comes out ready to use on the other end. Amazing. Tenons and mortises are all specialty machine done, of course. Assembly, from what I could see, was done by hand. I watched a craftsman assembling a panel of some sort with several tenoned boards; he selected the each board and installed it with best side facing out. Even clamping was done efficiently – with large presses, as seen in the pic above. This saves time, and has more even pressure across the whole piece, instead of selected spots – improved result, more efficient technique. We also witnessed a guy who’s only job was to fit drawers into different case goods; a team that repaired pieces that came through the assembly, ready to have a finish applied – only to find a ding, veneer sand-though, or other unacceptable flaws. We didn’t see actual finishes being applied – probably a trade secret – but we did see pieces that were finished set out to dry, and then finally the folks that do the final finishing touches on the pieces, with large vertical, portable light panels to move about the piece to aid in finding flaws. The tour was quite good, and lasted about 45 minutes. I can say I have a deeper appreciation for their product, and certainly respect and admire their workflow. They are a truly classic American company.